We provide many kind of giant chess piece product. Our giant chess are made of Teak wood and polished well. The Teak wood has guarantee for its durable. So our product excellent for use outdoors and can be left in the sunshine, rain or snow without being damaged. If you like to use it indoors, you can also have wonderful game of chess with your partner. Look its elegant of our black chess pieces. Sure that with high quality of chess pieces, you will enjoy your game till end. You can buy this chess set as your collection at home and having chess game with your partner. You also can put it as your room or living room accessories. 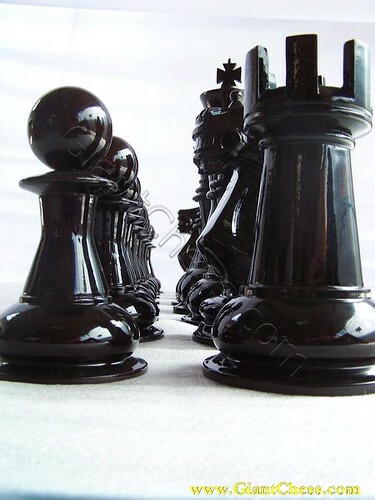 Black chess pieces can give you many idea. You can use it as a gift to your friend, work partner, family, children or other person related with you. Sure that this unique gift more worth and expressive.